Axes, air packs, and cord reels are just some of the equipment carried on the new truck. Photo by the author. The vehicle also carries a variety of cables, chains, and winches for rescuing people from every imaginable situation. Photo by the author. The new rescue truck was placed in service just after 1 PM at a ceremony attended by personnel from the WVRS and the Montgomery County Fire and Rescue Service, as well as members of the community. Remarks were given by Wheaton Volunteer Rescue Squad President Gamunu Wijetunge, WVRS Chief Mark Dempsey, and MCFRS Chief Scott Goldstein. To ceremonially prepare the new rescue truck for duty, a pair of the "jaws of life" were transferred from the old rescue truck and placed in a compartment on the new rig (all other equipment had been mounted on the new truck in the preceding weeks). To formally place the unit in service, the chief radioed the MCFRS Emergency Communications Center (ECC), which handles the dispatching of all fire and EMS units in the county, to advise the ECC that the new truck was ready for service. The members of the Wheaton Volunteer Rescue Squad then pushed the new truck into its quarters by hand, a fire service tradition, while bagpipes played "America the Beautiful" in the background. The new truck replaces a rescue truck that had served the community in one form or another since 1986. As explained by the WVRS president, the body of the old truck (the large boxy part behind the cab, containing the tools and equipment) had been around since 1986. In 1996, the body was placed on a new Mack cab and chassis after the old chassis was damaged in a collision. The 1986 rescue body on a 1996 chassis has been serving the citizens of Montgomery County ever since, for an amazing 30 years of service to the community. Since its 1996 reconfiguration, it is estimated that the old rescue truck responded to at least 40,000 emergency calls, with the engine having over 192,000 miles on it, making it the busiest and longest serving heavy rescue vehicle in the state of Maryland, and perhaps the United States. The 1996 Mack rescue truck was placed out of service after long career of service. Photo by the author. The new rescue truck is much bigger than the old Mack, and it carries more tools and equipment than than other rescue trucks currently serving Montgomery County The new rig is 37 feet long and weighs 35 tons (70,000 lbs), with tandem axles in the rear. The cab and chassis of the new truck were built by Seagrave Fire Apparatus of Wisconsin, while the rescue body containing the equipment was built by a New Jersey company called Rescue 1. The vehicle was funded though a variety of sources, including donations from the community, the Maryland Military Department, the Maryland State Fireman's Association, the Montgomery County Fire & Rescue Service, and the Montgomery County Volunteer Fire & Rescue Association. The new rescue truck in quarters awaiting its first call. The spinning light on the grille of the truck is called a "Roto Ray" and it's awesome. Photo by the author. It didn't take long for the new rescue squad to get dispatched on what would be the first of thousands of emergency calls. Approximately half an hour after being pushed into the station, Rescue Squad 742 was alerted to respond to Jones Lane in Wheaton for a fire alarm. With dozens of spectators watching, the shiny new rig rolled out of the station and up Georgia Avenue. The Wheaton Volunteer Rescue Squad is staffed entirely by volunteers on weeknights and weekends, with county career personnel supplementing volunteers between 7:00 AM and 5:00 PM weekdays, making the station's 11,126 emergency calls in 2015 an impressive number. 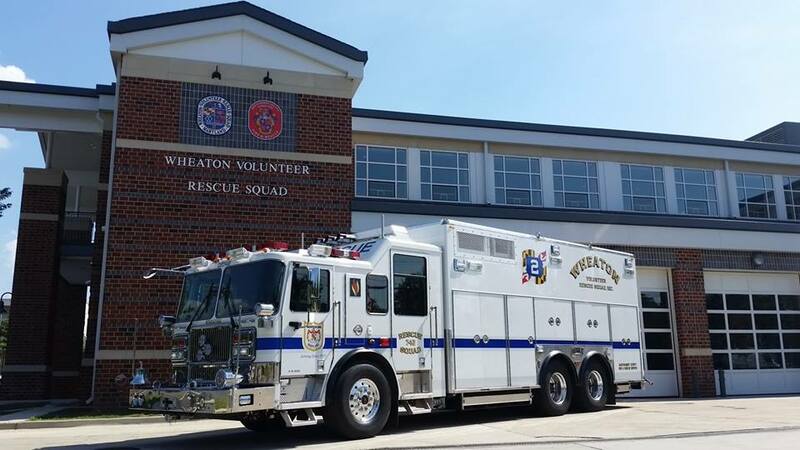 Last year, Wheaton's two heavy rescue vehicles responded to a combined 3,280 calls, or about nine emergency runs a day. With call volume expected to rise, the new Rescue Squad 742 and the station's other heavy rescue vehicle (a 2004 model) will likely carry on the tradition of being the busiest heavy rescue company in Maryland. The seal on the podium of today's festivities. Photo by the author. The new Rescue Squad 742 is a state of the art rig that will enable the WVRS and MCFRS to provide county residents with high-quality fire and EMS service for decades to come. To learn more about the rescue squad and to donate towards new vehicles like this one, visit the WVRS website. This truck is very useful.